New-to-me 06 LR3 SE HD. Black wasn't the color I wanted but it's hard to find an HD package car. Previous owner had it 8 years to haul their kids... this photo (taken less than a day after purchase) is likely the first time it had left pavement. 108k miles. So far I've added nearly a gallon (!) of trans fluid and fixed the frayed fog lamp wiring. Duratracs, new coolant tank, lower control arm bushings, and a complete transmission service coming right up. And an IID tool of course. And all of the fluids and filters. And a new battery. So far it's been a significant shift in the positive direction from my '06 Xterra 6spd OFF ROAD (same as PRO-4X). I wanted better road manners, better front suspension, a little more space, and better headlights. The LR3 has delivered on all fronts, and added heated seats which help the GF fall asleep even more quickly. 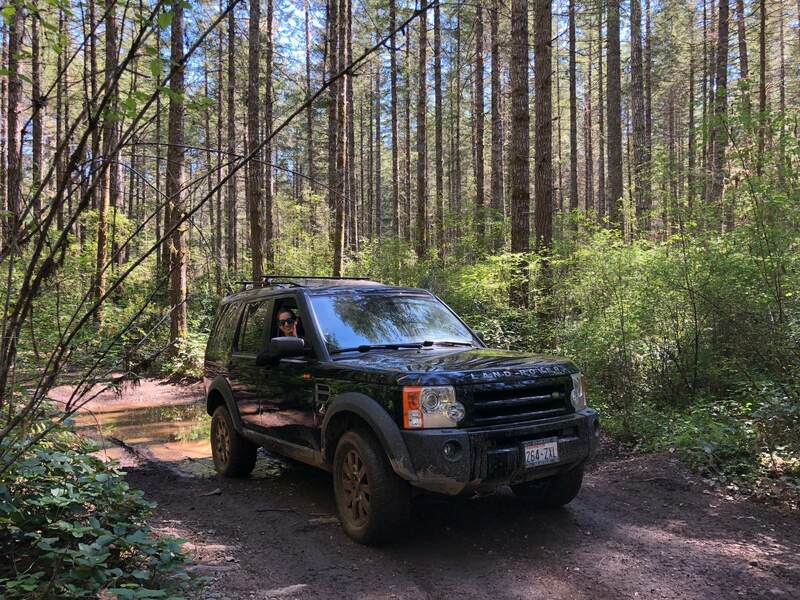 I'm a week into my second Land Rover. My first one was a 1969 SIIA 88" that I enjoyed but in those pre-interweb days of the late 80's there weren't the knowledge and availability of parts to keep it going as a DD. Sold it to a cow-orker who whined at me every time it did some sort of Land Rover thing. One never forgets and so it's been 30 years, give or take, and now it's time for something new and something blue. Meet Winston, our 2008 LR3 that replaces my BMW 525xi that was taken out by a hoof rat. We wasted no time hitting some of the local "seasonal roads". Not stuck up a picture of mine in a long time. We have had an unusually dry summer so water levels weren’t high. 2004 TDV6 HSE, about to tick over 180,000 miles. Full Prospeed underbody protection, sliders etc. Prospeed rear ladder. Full length front runner rack with expedition rails. LR guard front and rear. A bar and spots. Genuine LR winch sump guard. 4 Pot Brembo front brakes and V8 rear upgrade. Finally got to try out the new wheels and tires. Latest addition, along with Prospeed tree sliders. Love the Compomotive with Brembo 4pot on the front. Hi All! I'm new to Land Rovers and just picked up a bone stock 2011 LR4. I plan to put on 18" wheels and AT tires ASAP. I've also ordered up a Rhino hitch for towing duties, and will need to get some sort of roof rack in place before ski season. Bikey I think The 4 pot Brembo calipers only fit Compomotive 18" wheels, even then the harmonic balance blocks have to be reversed. I think 19" are ok.
Update shots of her now with hardshell RTT. Man, that's pretty slick on the Prospeed rack! Looking cool breezes! Out of curiosity, what is the overall weight of the RTT? So the weight is prob...#115ish. I saw a variety of numbers when doing research, with the Autohome being the lightest by a stretch and that seems to bear out in terms of our ability to mount it just me and the wife, as well as the fact that COG impact has been minimal. Hell, I’m getting 14mpg still so even the shape is working well. That's good info; #115 is well inside the acceptable range for sure IMO. Considering the ease, hardtop, aerodynamics, etc., that's about as ideal as it gets for RTT. It is definitely optimal, from our initial tests-for us. I say that b/c to be transparent for others there are considerations to account for-this is optimized for what you describe. Ease of use, gas mileage, etc. It also works b/c we're short...if we weren't I think the Autohome in the clamshell form would get old (I'm 5'5", wife is 5'4"). That said, I think we'll find it having been well worth the $. If we had a different rack than the prospeed I think other options would have been explored-i.e. the JB Evo Space and such. I wouldn't want a different rack mind you, but for those out there with other options...I'd explore the range of things. But I'm OCD, and this was enough money that we racked and stacked variables.